Paul Martino has been involved locally in personal fitness since 1996. After graduating from Texas A&M University in 1993 with a degree in Kinesiology (the study of the mechanics of body movements), Paul continued his education as an intern at Midwest Sports Training Center and Hammons Heart Institute. He is a Certified Personal Trainer / member of the National Strength and Conditioning Associating (NSCA) and continues his education through seminars and conferences around the country. Paul’s training philosophy and standards of personal coaching and instruction require close personal work with each of his client’s personal objectives and needs. His extensive experience has proven that an effective training program must be individualized. Development and implementation of a Wellness Program for the city of Nixa, Missouri, is one of his proudest accomplishments. And his work as a personal trainer at HealthTracks Sports Training Center from 1998 to 2004 allowed him to work with one of the most highly regarded healthcare-oriented fitness centers in the region. 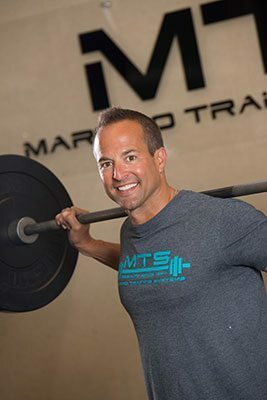 In 2004, after six years as a personal trainer at HealthTracks Sports Training Center, he founded Martino Training Systems so he could more completely explore and implement his views and philosophy of fitness training. This has made Paul a recognized leader in personal fitness and set him quite apart from other trainers and fitness coaches locally and regionally. Since then Paul has continued to build an outstanding reputation because of his passion for personal excellence and his strict adherence to professionalism in every aspect of personal training and fitness. Paul’s academic and hands-on experience is impeccable. Paul is also certified for highly specialized training using the kettlebell through the Hardstyle Kettlebell Certification (HKC). Kettlebell exercise methods must be done within crucial tolerances specifically adjusted to the client’s personal abilities and strength. Paul’s rigorous philosophy of personalized training programs, and his certification with HKC, is an example of the foundational attitude of personalization that Paul has integrated into all Martino Training Systems’ fitness programs. Those who know and are associated with Paul attribute the outstanding success of Martino Training Systems to Paul’s professionalism and non-compromising methodology, which attracts of the cream of the crop of athletes who cannot compromise their goals and objectives to excel in their areas of endeavor. This on-going success that has enabled Martino Training Systems to grow from one to three locations in just six years confirm his philosophy. Paul has assured this growth has been both careful and deliberate by selecting and employing only motivating trainers with similar philosophies. All trainers at Martino Training Systems are degreed and certified and demonstrate outstanding professionalism and passion for their work. Paul’s goal is to provide professional, personalized training in the latest and most viable techniques to give his clients the very best possible training. But more. Paul’s separate but equal goal is to instill in each of his clients the empowerment of having attained the very best in personalized fitness through their own personal efforts.